Students march from Norris University Center to the Allen Center, where a Board of Trustees meeting took place Friday. 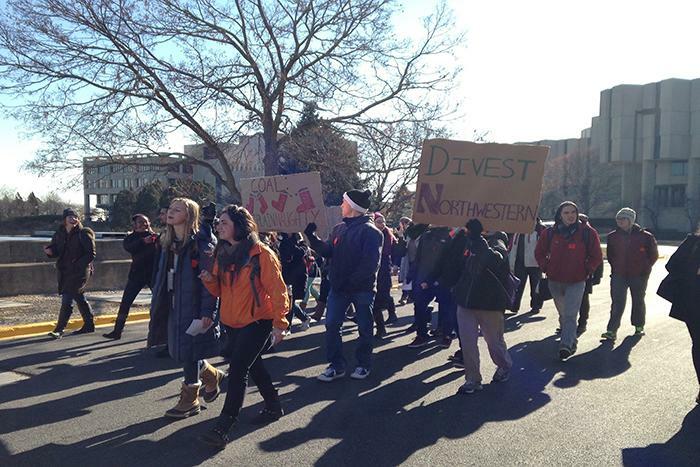 The demonstration was organized by DivestNU to ask Northwestern to divest its endowment funds from the coal industry. About 30 Northwestern students from the DivestNU movement demonstrated Friday morning before a Board of Trustees meeting, asking the University to divest its endowment money from the coal industry. “We want solutions, not coal pollution,” they chanted outside the Allen Center, where the meeting was scheduled to take place. Members of DivestNU, a movement calling for the University to re-invest endowment money in more environmentally sustainable ventures, met with part of the Board of Trustees’ Investment Subcommittee on Thursday. According to DivestNU, chief investment officer Will McLean has calculated that $17 million of NU’s $8 billion endowment goes toward the coal industry. Organizer Scott Brown, a Medill sophomore, said the meeting allowed DivestNU to show the subcommittee that students support the issue. On Friday, students marched from Norris University Center to the Allen Center, waving signs and a banner listing student groups that support the movement. Groups that signed in support include Associated Student Government, Eco-Reps, Green House, the Taiwanese American Students Club, Real Food at NU, In Our Nature, Wild Roots and the NU Summit on Sustainability. “This is one of the biggest issues of our generation,” said Weinberg junior Lucy Blumberg, who participated in the demonstration. Blumberg said although she found a “positive attitude” at the demonstration, she wished more students were aware of the issue. “There’s a general apathy when it comes to climate issues on this campus,” she said. During the demonstration, art history Prof. Stephen Eisenman stopped on his way into the Allen Center to express his support for the students. Eisenman, chair of the Faculty Senate, told The Daily he is glad to see students organizing around climate change. Brown said NU is committed to climate change in many ways, including in its strategic plan and in research on campus.